I’ve kissed a lot of relics as a Catholic, but one never kissed me back – until now. 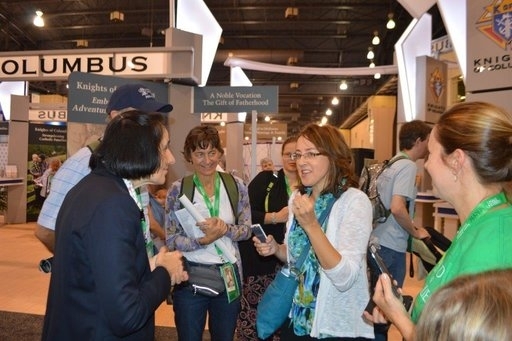 I’m talking about the daughter of St. Gianna Beretta Molla, Gianna Emanuela Molla, who is in attendance at the World Meeting of Families in Philadelphia all week (this article originally appeared in The National Catholic Register, 9-24-15), graciously offering herself to the faithful (potentially 17,000 of them, yesterday alone). If our bodies are built cell by cell, out of the flesh and blood of our dear mothers, then Gianna is indeed a first-class relic of her mom. Anyone who has heard her story knows she is more than that. She is the child for whom her mom gave her life. Doctors induced labor on April 21, 1962, Good Friday. After laboring all day and night, St. Gianna delivered a healthy baby girl, Gianna Emanuela, via C-section, on Holy Saturday. Days later, the loving, saintly mother died from septic peritonitis. Now I am standing before this child. Gianna Emanuela reaches out and warms my hand, and I have a sense that life is being transmitted to me through her. She listens attentively to me and smiles. My day has been full of friendly greetings: old friends and new, acquaintances and colleagues. But hers is the most generous, both in the moment and in everything that has led up to it. She had arrived in Philadelphia on Monday, in time to be godmother to a friend’s lucky baby in a private ceremony nearby. She has traveled from Italy on her own dime so that she can freely decide how best to reach the greatest number of faithful. Dealing with Church and secular authorities has not been easy. Originally, it had been hard to get her an exhibit booth. “We can’t just let anybody in.” So Bob White, president of the Society of St. Gianna, was told. So much that went into producing this opportunity for the faithful — the relic case was the wrong size, the wedding gown of St. Gianna needed to be steamed, and the van had to be towed — wore on Gianna and even brought her to tears. Bob’s wife, Maryellen, fills me in on all of that prior to our meeting, yet I am ashamed to say that, when it’s my turn, it never occurs to me to ask her how she is feeling. It was several hours into her greeting the faithful before any of us asked her if she’d like something to drink. She drank a fruit beverage in less than 30 seconds, but she never once complained that she was thirsty or hungry. I greet her with, “Piacere Doctoressa!” Though she’s a doctor like her mom, Doctoressa probably isn’t right. I just like the way it sounds, and I am a ham. She enjoys being greeted in pig Italian, but sweetly tells me, “I am just Gianna.” “It was this way that she gives herself to us all, as an ambassador for life, for grace and for the hope of salvation through carrying our crosses. She had spent the morning at the cathedral in Philadelphia because she wanted to hear “Mr. Bob” speak. I am sure Mr. Bob told St. Gianna’s story in the authentic, capable way I’ve seen him do before and then invited the faithful up to venerate first- and second-class relics. I missed this portion of the event due to commitments at the congress, but my traveling companion, Louisa, was there to behold St. Gianna’s stunning wedding dress on my behalf. I discover that we share the same wedding anniversary, Sept. 24, the day I am posting this story. It must be Providence. Maryellen shows me pictures of the gown, and I am reminded of the hidden half of St. Gianna, her husband, Pietro, the man Gianna Emanauela fondly refers to as “Daddy.” He quietly carried on after the death of his wife, to bring up their four children in the faith and to give a heroic witness of his own, spanning nearly 50 years of widowhood. Pietro’s response was immediate: “I love you, my dearest Gianna.” He then echoed her desire to have a family with her and to make her happy. Before closing, he asked her to forgive him “for not beginning a closer confidence” with her sooner. The little group clustering around, waiting to meet her, breaks out into laughter. I make way for them. They have messages for her, personal inspirations to share and stories of prayers answered. The line is growing longer. Word is getting around that it’s not just anybody who is here — but a saint’s child — a living, breathing, smiling, first-class testament that love overcomes even death. This article is slightly altered and used with permission. Photos courtesy of Bob and Maryellen White.